Before Tim Horton was a brand name, he was a star defenseman for the Toronto Maple Leafs. He played from age 20 (1949-50) to age 44 (1973-74) when he was fatally killed in a car crash. After playing his first NHL game in the 1949-50 season, Horton did not become a full time NHLer until the 1952-53 season. In 1954 his stellar defensive play began to be noticed. He was selected to the Second All-Star Team. It was the first of six times that Tim would be voted to the All-Star Team. From 1963-1969 he would be voted to the First Team three times, and the Second Team two more times. He wasn’t overly tall, but his hits were always hard. He played each game with a spectacular mix of physicality and skill. He was a great player with and without the puck. In 1965, Horton was actually told to play forward with Red Kelly (also a defenseman playing a forward position) and George Armstrong. As a forward he scored 12 goals, his highest single-season career total. 1962 saw Horton’s Leafs win their first of three consecutive Stanley Cups from 1962-64. He would have his best offensive performance in the post-season that year, scoring three goals and 13 assists in 12 games. Toronto would win a fourth Cup with Horton in 1967. At age 40, Toronto traded Horton to the New York Rangers. Soon after arriving in New York, he was selected in the next two intra-league expansion drafts and had a short stint in Pittsburgh. He finally landed in Buffalo, where he would play his final NHL game in 1974. His doughnut business, which is now called “Tim Horton’s Café and Bake Shop” began back in 1964, and allowed Horton to become a multi-millionaire. Yet even though he was making that much money, he stilled continued playing hockey all the way until the day he died (10 years after the inception of his shops). As a player, Horton made around $40,000. But it wasn’t about the money. He continued playing the great sport of hockey because of love of the game…just some things to think about next time you see his picture on the wall of a Tim Horton’s. Having just played parts of two seasons with the Sabres, Buffalo retired his number two in 1996. He was posthumously inducted into the Hall of Fame in 1977. It’s probably hard for you to picture a 5-foot-8 player being nicknamed “terrible.” He played much bigger than his size. Players grew to fear Lindsay’s aggressive playing style. He wasn’t just aggressive. He was strong with the puck. He wasn’t afraid to hit someone much bigger than him. That was Lindsay’s mindset. He seemingly had little fear when it came to throwing a hard punch or a crushing check. It was that kind of style that allowed the “Production Line” of Lindsay, Sid Abel (Alex Delvecchio post- 1951-52), and Gordie Howe to be so successful. The line began in 1947, three years after Ted entered the league in 1944. One of their best seasons came in the 1947-48 campaign when all three of them had at least 44 points. Lindsay led the NHL in goals with 33. 1950 would see Ted win the Art Ross for leading the league in points with 78. 1950 would also be Lindsay’s first championship season. He would win three more Cups, all with Detroit, from 1952-55. In 1952 he led all playoff scorers in goals (5) and in 1955 he led all playoff scorers in assists with 12. He racked up 19 points in just 11 games in that year. He would score a total of 47 goals and 96 points in 133 career post-season games. Lindsay played in 1,068 career regular season games, scoring 379 goals and adding 472 assists. He would also accumulate 1,808 penalty minutes, which was the highest total of any player when he retired in 1965. His banner year for sin bin time was the 1958-59 season when he spent 184 minutes in the box. From 1948 to 1957, there was only one season (1955) that Lindsay was not named to an All-Star Team. He was voted to the First Team eight times and the Second Team once. Like Doug Harvey, Ted Lindsay was punished for his involvement in the players’ association. He was traded to the basement-dwelling Blackhawks, just as Harvey was traded to the underachieving Rangers. He would have some regular season success in Chicago, but his point drop was significant, going from 85 the year before to just 39 in two less games played. Lindsay retired in 1960, but four years later was coaxed back to Detroit after the firing of Jack Adams and the hiring of Abel as coach and general manager. Ted would play one more year, helping the Red Wings win the regular season championship in 1965. He was inducted into the Hall of Fame in 1966. 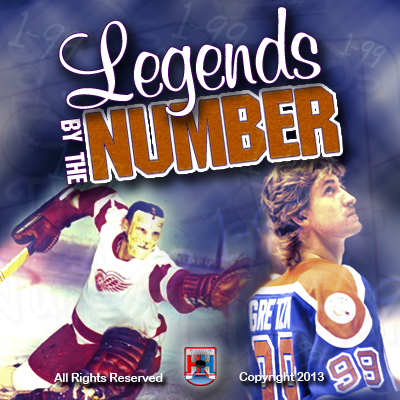 Detroit would raise Lindsay’s number 7 jersey to the rafters of Joe Louis Arena in 1991. Phil Esposito was a true superstar. There aren’t many other ways to briefly describe his career. He led the NHL in goals six times, assists three times, and points five times. He finished his 18 season career with 717 goals and 1,590 points. He sits fifth all-time in goals in the elite 700 goal club. After entering the league with Chicago in the 1963-64 season, he would end up in Boston via trade in 1967. While playing for the Bruins, Esposito teamed up with wingers Wayne Cashman and Ken Hodge (who was traded along with Esposito in the trade) to form the famous “Nitro Line.” Their breakout year came in 1970-71 when all three finished in the top 10 in team scoring. In 1973-74 they finished in the top four, sandwiching Bobby Orr. In the 1970-71 season, Esposito had his famous record-breaking year. He scored 76 goals and 76 assists for 152 points in 78 games (new league records). This came after he was the first player in league history to even score 100 points in a season (1968-69). That season he didn’t just eclipse 100 points. He scored 126 points. The 76 goal season went unmatched until Gretzky scored his famous 92 goals in 1981-82. Even Gretzky only surpassed 76 goals just twice in his entire career. Teemu Selanne scored his famous 76 goals in his rookie season in 1992-93, but he never exceeded that total. In the 1969-70 campaign, Boston finished the regular season having scored a league-leading 277 goals. They finished second in their division, but dominated in the playoffs. After edging out the Rangers 4-2 in Round 1, they proceeded to sweep Chicago and then St. Louis for the Cup. Esposito scored a league-leading 13 goals and 27 points in those 14 playoff games. The year before he led all playoff scorers with 18 points in just 10 games. The following year, the Bruins scored an incredible 399 goals, exceeding the prior year’s total by 122. The top six in plus/minus that year were all Bruins. Even Esposito’s 71 was tied by linemate Hodge and surpassed by teammates Dallas Smith and Orr. In 1971-72, Esposito once again led all playoff scorers in goals (9) and points (24) en route to his second Stanley Cup. In his 18 seasons, Esposito scored 50+ goals five times (in consecutive years), 50+ assists seven times (in consecutive years), and 100+ points six times (it would have been seven consecutive years, but he had 99 points in 1969-70). He was named to the All-Star Team eight consecutive times from 1968-75. After a shocking trade to the Rangers that put a halt on Esposito’s streak of five consecutive 100+ point seasons, he would never score more than 81 points. At the time he was traded, Phil had already played 12 games for the Bruins and scored 16 points. His first full season in a Ranger uniform would see him score a team-leading 80 points in 80 games, which to his standards, were pretty low. His point totals were as consistent as they come. The next three seasons saw him score 81, 78, and 78 respectively. Each year those totals led the team. He led the Blueshirts to the Stanley Cup Finals in 1979, scoring 20 points in 18 post-season games at 36. Esposito would also have international success playing for Team Canada. He led all scorers in points during the famous Summit Series. He announced his retirement in 1981. At that time, only Gordie Howe had more goals and points, and only Howe and Stan Mikita had more assists. He was voted into the Hall of Fame in 1984. When future Hall of Fame defenseman Ray Bourque decided to wear number 7 in the 1979-80 season, it made it impossible to retire Esposito’s jersey. However, in 1987, Bourque relinquished his number 7, pulling off his jersey, and revealing his new jersey underneath (#77). This allowed for Boston to officially retire Esposito’s number 7 jersey.